The Sunday Bird Walk went to Buttertubs Marsh in Nanaimo. The highlights included the sighting of two young Merlins, Townsend's Warblers and Black-throated Warblers. Eighteen birders found the following forty-one species: Wood Duck, Mallard, Northern Shoveler, California Quail, Ring-necked Pheasant, Hooded Merganser, Pied-billed Grebe, Great Blue Heron, Bald Eagle, Sharp-shinned Hawk, Wilson's Snipe, Rock Pigeon, Belted Kingfisher, Northern Flicker, Northwestern Crow, Common Raven, European Starling, Violet-green Swallow, Barn Swallow, Purple Martin, Black Swift, Chestnut-backed Chickadee, Bushtit, Bewick's Wren, Marsh Wren, Swainson's Thrush, American Robin, Orange-crowned Warbler, Yellow Warbler, Wilson's Warbler, Townsend's Warbler, Black-throated Gray Warbler, MacGillivray's Warbler,Common Yellowthroat, Cedar Waxwing, Spotted Towhee, Song Sparrow, Purple Finch, House Finch, Pine Siskin and American Goldfinch. Red Crossbills were seen at Otter Place in the Long Lake Heights area in Nanaimo. A Heerman's Gull was seen in with a flock of California and Bonapart's Gulls at Columbia Beach. Three Common Nighthawks were spotted above the 2500 block of Glenayr Drive in Nanaimo. American Goldfinch, Black-headed Grosbeaks, Pine Siskins and California Quail are visiting feeders along Morden Road in Cedar. Black-bellied Plovers, Ring-billed Gulls and Bonaparts Gulls were seen at Columbia Beach. Over thirty Common Nighthawks and several Black Swifts were seen over 2500 block of Glenayr Drive in Nanaimo. Two Northern Pygmy Owls were photographed in backyard along Belaire Drive in Nanaimo. Vaux Swifts and Common Nighthawks were seen above the 7000 block of Aulds Road in Nanaimo. A Brown Pelican was spotted about one mile off Brent Point at Rathtrevor Provincial Park in Parksville. Great Blue Herons with young were seen on nests on Protection Island, as well as several Bald Eagles and six Turkey Vultures. A Black-headed Grosbeak was seen at feeders along Shady Mile Way just off Jingle Pot Road in Nanaimo. An Osprey was seen hovering and diving for fish on the north side of Departure Bay Beach in Nanaimo. 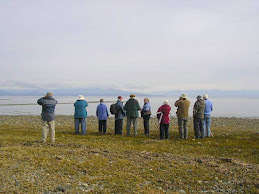 We will not be holding the Wednesday Bird Walks in Parksville for the rest of the summer months. We will resume them in the fall and will provide the exact date as fall approaches. The Sunday Bird Walk on August 05, 2007 will be going to Pipers Lagoon in Nanaimo. Meet at the Bird Store at 9:00 a.m. or at Pipers Lagoon off Hammon Bay Road at about 9:15 a.m. The Sunday Bird Walk went to the Ladysmith Harbour in Ladysmith. The highlights included the sighting of six Red Crossbills, a Peregrine Falcon and over sixty Purple Martins. Thirteen birders found the following thirty-two species: Great Blue Heron, Double-crested Cormorant, Turkey Vulture, Bald Eagle, Peregrine Falcon, Glaucous-winged Gulls, Western Sandpiper, Black Oystercatcher, Rock Pigeon, Northern Flicker, Northwestern Crow, Common Raven, European Starling, Purple Martin, Violet-green Swallow, Barn Swallow, Tree Swallow, Chestnut-backed Chickadee, Brown Creeper, Bewick's Wren, American Robin, Orange-crowned Warbler, Yellow Warbler, Spotted Towhee, Song Sparrow, White-crowned Sparrow, Golden-crowned Sparrow, Purple Finch, Red Crossbill, House Finch, Pine Siskin and American Goldfinch. An Evening Grosbeak was spotted along Arbot Road near Westwood Lake in Nanaimo. Several Northern Flickers, Chestnut-backed Chickadees, Red-breasted Nuthatch, House Finch, Pine Siskins, Spotted Towhees, American Robins, Northwestern Crows, Dark-eyed Juncos, Brown Creeper, Golden-crowned Kinglet, Rufous Hummingbird and Band-tailed Pigeon were seen in the 5500 block of Ventura Drive in Nanaimo. A Black-headed Grosbeak was spotted along Northwind Drive in Upper Lantzville. Two Albino Common Ravens were seen in the 3200 block of Grandon Road in Qualicum Beach. Common Nighthawks and Black Swifts were seen along Despard Avenue in Parksville. An American Kestrel was seen at the corner of Despard Avenue and Meridian Way in Parksville. A Bullock's Oriole was seen in the 3600 block of Glen Oaks in the Stephenson's Point area of Nanaimo. A Caspian Tern was seen near the Sands Funeral Chapel area in downtown Nanaimo. The Sunday Bird Walk on July 29, 2007 will be going to Buttertubs Marsh in Nanaimo. Meet at the Bird Store at 9:00 a.m. or at the parking lot at Buttertubs Marsh on the Bowen Road side at about 9:15 a.m. The Sunday Bird Walk went to Legacy Marsh in Upper Lantzville. The highlights included the sighting of six Red Crossbills and four Evening Grosbeaks. Eighteen birders found the following thirty-five species: Turkey Vulture, Bald Eagle, Merlin, Band-tailed Pigeon, Black Swift, Rufous Hummingbird, Willow Flycatcher, Pacific-slope Flycatcher, Cassin's Vireo, Warbling Vireo, Violet-green Swallow, Barn Swallow, Chestnut-backed Chickadee, Red-breasted Nuthatch, Winter Wren, Marsh Wren, Bewick's Wren, Swainson's Thrush, American Robin, Common Raven, Northwestern Crow, Cedar Waxwing, Orange-crowned Warbler, Common Yellowthroat, Western Tanager, Spotted Towhee, Song Sparrow, Fox Sparrow, White-crowned Sparrow, Dark-eyed Junco, Black-headed Grosbeak, Red-winged Blackbird, Purple Finch, Pine Siskin and American Goldfinch. An immature Western Tanager was spotted in the 4200 block of Jingle Pot Road in Nanaimo. Four Long-billed Dowitchers and thirteen Least Sandpipers were seen at the Englishman River Estuary in Parksville. Several COMMON NIGHTHAWKS were seen at Craig Bay in Parksville. A BLACK-HEADED GROSBEAK was seen in the 200 block of Dawkins Lane in Nanaimo. COMMON RAVEN, VIOLET-GREEN SWALLOW, NORTHERN ROUGH-WINGED SWALLOW, BARN SWALLOW, CHESTNUT-BACKED CHICKADEE, WINTER WREN, SWAINSON'S THRUSH, AMERICAN ROBIN, CEDAR WAXWING, ORANGE-CROWNED WARBLER, TOWNSEND'S WARBLER, MACGILLIVRAY'S WARBLER, WESTERN TANAGER, SPOTTED TOWHEE, CHIPPING SPARROW, SONG SPARROW, WHITE-CROWNED SPARROW, BROWN-HEADED COWBIRD, PURPLE FINCH, HOUSE FINCH, AMERICAN GOLDFINCH. Over fifty COMMON NIGHTHAWKS were seen above the Golf Course at Qualicum Beach. A GREAT HORNED OWL was seen near the Fairwinds golf course in Nanoose Bay. COOPER'S HAWK, RED-TAILED HAWK and many TURKEY VULTURES were seen at the Lantzville Foothills. We will not be holding the Wednesday Bird Walks in Parksville for the rest of the summer months. We will resume them in the fall and will provide the exact starting date as fall approaches. just off Highway One in Ladysmith at about 9:30 a.m. The Sunday Bird Walk went to McGregor Marsh in Nanaimo. The highlights included the sighting of four WESTERN TANAGERS and several WARBLING VIREOS. Twenty-six birders found the following forty-nine species: GREAT BLUE HERON, TURKEY VULTURE, GLUCOUS-WINGED GULL, MALLARD, HOODED MERGANSER, BALD EAGLE, RED-TAILED HAWK, MERLIN, CALIFORNIA QUAIL, SPOTTED SANDPIPER, BAND-TAILED PIGEON, ANNA'S HUMMINGBIRD, RUFOUS HUMMINGBIRD, DOWNY WOODPECKER, NORTHERN FLICKER, PILEATED WOODPECKER, PACIFIC-SLOPE FLYCATCHER, WILLOW FLYCATCHER, HAMMONDS FLYCATCHER, OLIVE-SIDED FLYCATCHER, WARBLING VIREO, CASSIN'S VIREO, NORTHWESTERN CROW, COMMON RAVEN, VIOLET-GREEN SWALLOW, TREE SWALLOW, BLACK SWIFT, CHESTNUT-BACKED CHICKADEE, BUSHTIT, RED-BREASTED NUTHATCH, BEWICK'S WREN, BROWN CREEPER, RUBY-CROWNED KINGLET,SWAINSON'S THRUSH, AMERICAN ROBIN, CEDAR WAXWING, WESTERN TANAGER, ORANGE-CROWNED WARBLER, YELLOW WARBLER, SPOTTED TOWHEE, SONG SPARROW, SAVANNAH SPARROW, BLACK-HEADED GROSBEAK, BROWN-HEADED COWBIRD, PURPLE FINCH, HOUSE FINCH, PINE SISKIN, DARK-EYED JUNCO and AMERICAN GOLDFINCH. A RED CROSSBILL was observed at feeders and a COMMON NIGHTHAWK was seen soaring above the 200 block of Dawkins Lane in Nanaimo. A BARRED OWL was seen perched on a Hydro line just outside the gate at Spider Lake Springs Campground at Spider Lake. WARBLER, SPOTTED TOWHEE, SONG SPARROW, WHITE-CROWNED SPARROW, RED-WINGED BLACKBIRD, BROWN-HEADED COWBIRD, PURPLE FINCH, HOUSE FINCH, AMERICAN GOLDFINCH, HOUSE SPARROW. Four SILVER PHEASANTS were seen in the 6200 block of Icarus Drive in Nanaimo. A pair of MOURNING DOVES are visiting yards in the 100 block of Meridian Way in Parksville. A WESTERN TANAGER was spotted in the Cedar area near Boat Harbour. A YELLOW-RUMPED WARBLER was seen at suet feeders along Woodhaven Drive in Nanaimo. A family of NORTHERN FLICKERS, two families of CALIFORNIA QUAIL with at least twenty-four chicks and several AMERICAN GOLDFINCH are visiting feeders in the 1200 block of Gabriola Drive in the Craig Bay area of Parksville. A SHARP-SHINNED HAWK was seen chasing AMERICAN GOLDFINCH in a yard along Meridian Way in Parksville. We will not be holding the Wednesday Bird Walks in Parksville for the rest of the summer months. We will resume them in the fall and will provide the exact date as fall gets closer. Meet at the Bird Store at 9:00 a.m. or under the Hydro Lines on Normarel Drive off Superior Road at about 9:15 a.m.